What's New in this Ecker Site. This site has grown willy-nilly as I have been adding newly found material. Eventually I will do a reorganization. In the meantime, most materials are listed on two main pages: The "Ecker Family Documents" page, and a subpage: "William and Hannah Ecker." The former contains materials focused on the American Eckers, and the latter on William and Hannah themselves and ancestral records from Germany. (There is a little crossover and some relevant links are on subpages.) From now on, I will list new materials in this table with the newest on top. That will eliminate the need to examine the Ecker pages in their entirety, although I recommend doing that the first time. Peter. Placed gravestone marker on graves of Catherine Burke Beaver and daughter Edith Agnes Beaver Ecker. Also new stone for Hannah Squire Ecker and discovery of Civil War stone of Abfraham Wilhelm Ecker. Found Baptism of Catherine Burke in Irish Catholic Registry. Immigration history of Newark Eckers, and other Eckers from Unterreichenbach. Historical evidence for the reasons why the Ecker siblings left Unterreichenbach, Germany for Newark. A new summary of the life of Kate Burke Beaver with original documents presented. 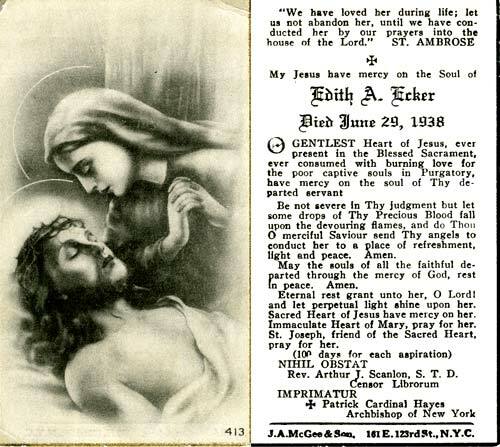 Funeral card for Edith Agnes Beaver Ecker with wrong date. Sample of photograph of actual Unterreichenbach church record. Added 16 pages of items related to the History of the German Evangelical Church in Newark. These were stored with the church books. I posted a good bit of material about the Eckers buried in Woodland Cemetery. Most of these people are discendants of William Ecker's brothers Jacob and Christian, but there are at least three additional children of William and Hannah buried there--- my GG Uncles and Aunts. Expanded list of New Jersey Death Certificates with links to originals. Eighteen new certificates before 1900. Ecker pages from Newark City Directories in 1900 and 1910. Placed of all the Ecker Church Records from the German Church in Newark in the mid-to-late 1800s. There are about 20: all that I could identify. With translations and interpretations. Some photos of Fairmont Cemetery where William and Frederick and their families are buried. Listing of William Ecker in the Albany, NY, City Directory in 1870 and years following. Added Newark Church records for marriage of William Ecker and Hannah; and brother Friedrich Ecker & Barbara. Other church records to follow. See 2 Mar above. I recently made a 2 week swing through the old Ecker homelands in NJ and NY. I will begin to post the many historical documents and other information. Look here for a summary. Added the Family Register of Martin Ecker from Hallwangen. This takes the Eckers back to the late 1600s. Martin is my 8G Grandfather.